The purpose of this book is to help you quickly and easily create a perfect resume that will go a long way toward getting your next job. Your resume is the only information a new employer has when deciding if you should be one of the lucky ones selected for an interview. You need to get into their head to know what they are thinking or seeking in a job candidate. Luckily for you, I have all that information in an easy to read and action format. Throughout this book you will be provided with tools and resources such as resume templates, a job tracker form, videos as well as good and bad examples of how to present your resume and yourself. All this information will allow you to create an effective resume to help secure that new position. If you are out of work there is already enough pressure on you. You might be the sole bread winner for the family, unexpectedly found yourself retrenched or desperately trying to help your children find work before they become one of the long-term youth unemployment statics. This book is designed to cut to the chase, no fancy words, no long winded information. It provides you with what you need to take the first step toward finding work – an awesome resume. The first part of the book shows and leads you through how to create your spectacular resume and the second part covers preparation and presentation at your interviews. Hi there, I am Kate Prior and I have been in recruitment for over 20 years, working with clients to understand what they are looking for in job seekers and how to best represent job seekers to give them the highest possible chance of getting the job they desire. During my career I have successfully placed over 1,500 job seekers. In 2005 I started my own recruitment agency, called face2face Recruitment. In 2010, my recruitment agency won a national award, Australian Small Business Champion Award for Recruitment Services. In 2012 we were a finalist in this category. Every time someone sits in front of me looking for a new job, I find myself and my team providing the same advice over and over again. This was the catalyst for producing this book. It is tough out there looking for work, so I wanted to make it as easy as possible. Australia is experiencing the highest unemployment rates in decades. This means more people looking for work more people competing for the position you want. It is so much easier when you have the tools to know how to best present yourself. In this book I have provided samples of resume templates you can quickly and easily use to create your job-getting resume. Also included are other tools for your arsenal to assist in getting that job. They have all been designed to provide you with the tactics and information you need in the simplest and fastest way possible. Remember that getting an interview from your resume is the first step, the second is doing well in the interview. 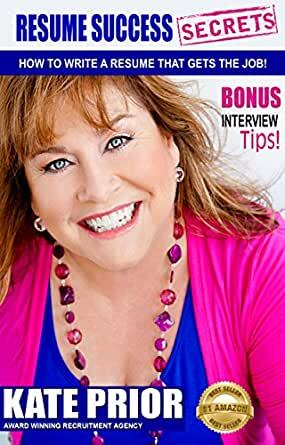 Your bonus Chapter Nine, Interview Tips, is designed specifically to help you with this. It provides advice on combating your nerves, what type of questions to expect and ways to best answer them. Ready? Let’s get right into it and start Chapter One, Resumes, which will lead you towards creating a great resume, the first step in getting that awesome job you want or job you need. Click on the buy now button and let's get started on securing your dream job! Kate has nailed exactly why you should take great care with your resume, and how to do it. It is slightly biased towards Canberra, but, that aside, it is equally suitable for anyone who is trying to represent themselves well. She repeats a few time - to drum it in - that you have Very Little Time to make a good impression. You may have slaved over the resume for weeks - but it will (generally) be read in five seconds. That makes it so important to get this right. Writing a quality resume isn't all that easy, except with this book. As a business owner I find it very frustrating when presented with poorly written and constructed resumes ... resumes that aren't informative or inspiring. That includes from anyone who has been in the workforce for awhile and grads who I tend to use for short-term assignments (interns also). Grads will find this book full of practical guidance and tips that are easy-to-apply in developing a resume that will truly stand out in the field. I'm glad I found Resume Success Secrets because it's a book I can easily recommend to grads. The chapter on digital footprints is extremely useful. The resume templates are fabulous. And the chapter on interview tips? A must read for anyone applying for a job, especially those who haven't been interviewed recently or those being interviewed for the first time. I'll be recommending Resume Success Secrets over and over and over. This book was fabulous. It is written in a conversational style which made it very easy to understand. This book also explains how to work with a recruiter, a must read if you intend registering with recruiters. It explains why you may never hear back from a recruiter and in a few easy steps how to be on the top of their preferred list. It really helped me to understand what changes I should make to my current resume. Knowing that most employers spend 60 seconds scanning my resume to make a decision whether I will be considered or not was an eye opener. I now feel confident with the tools provided to me in this book that I will have a successful outcome in my job search. 5.0 out of 5 starsThis is a real blueprint for resume success. As an employer this is exactly how I would want to receive resumes. So many times prospect just get it so wrong and even though they may be the best person for the job they don't get past resume stage. The book is easy to read with plenty of examples and should be a must read for everyone thinking of going for a new job. 5.0 out of 5 starsThe 60 second rule is GOLD! For years I wrote my own resumes and thought they were well done. Then a friend recommended this book to me and I learned what a professionally prepared resume looked like and how it can improve your employment prospects. The 60 second rule is GOLD. It's an easy read, easy to follow and implement and it makes a positive difference. Thank you Kate! 5.0 out of 5 starsGets straight to the point!! What's great is that there are no big words plus it is direct and to the point. This is the information I have been searching for, appropriate for all people seeking employment or a changing jobs. Finally, a book full of really useful hints, tips, templates from an industry specific person who has many years of experience! I hate to say this but as a mature age worker out there, it is not easy. This book gave me some great insights that I had never thought of before. Highly recommend it, whether you are just starting out or find yourself going back to work later in life. Thank you, thank you, thank you ……..